This morning’s lesson was intended to be a continuation of my Triple C course, but it changed into a boxing lesson. My client has a good background in Muay Thai and wanted to improve his punching skills. We looked a variety of punches, using set-ups from slips, bobbing and weaving, and the v-step. Training began with mirror footwork and then moved onto markers. This serves as a good coordination and cardiovascular warm-up as well as reinforcing solid boxing principles. Forward, backward, lateral and v-step footwork were all trained. Punches were then layered into the movements. 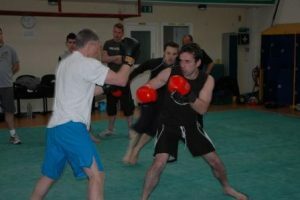 I then started coaching the slip/jab. This is performed as a single movement, ensuring that the slip is not just treated as a evasion technique. Then we trained the v-step/overhand before linking this with the first technique. Finally, we trained bobbing and weaving/liver and spleen shovel hooks. Here I also took the opportunity to introduce the peek-a-boo guard, which lends itself well to training upper body mobility training and Muay Thai, given its square-on stance. The full combination became an exercise in footwork, upper body mobility and coordination of punches. My client’s combination: slip/jab/v-step/overhand/bob and weave/shovel hooks. The lesson finished with three rounds of proactive pad-work. The first round we did flash-pad training, with my client throwing punches to whatever he was shown. The second round was restricted to defence-only with my client working on closing the distance using good footwork and upper body mobility. The last round put these together with my client knowing that every time he throw a punch he would need to have a strong defence.